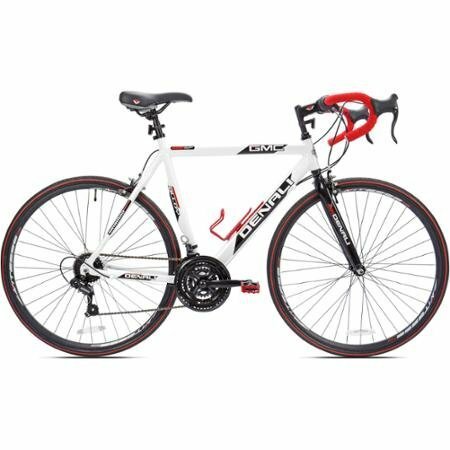 The GMC Denali represents an amazing value bicycle with all the features of a true road bike. It has a lightweight aluminum frame with a standover height of 32 inches. Industry leader Shimano provides the 21-speed drivetrain operated with easy light action Revo twist shifters and precise Tourney derailleurs. High-profile Vitesse alloy wheels roll smoothly and track accurately over any road surface you may encounter. Braking is controlled by front and rear alloy side pull brakes for sure stops in all conditions. A supple Vitesse seat and soft, sure grip handlebar tape keep you comfortable for longer rides. The Denali even comes with accessories like a kickstand and a water bottle holder included. Quite a bit of bicycle indeed.